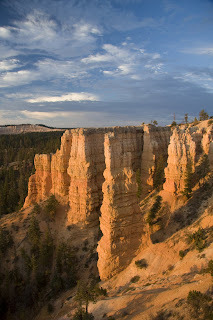 We stood up at sunrise and walked along the North Rim of Bryce Canyon to take pictures. It was really beautiful :-). 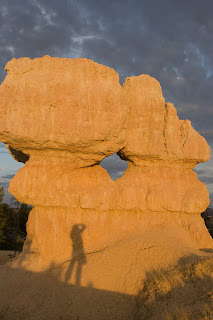 After having removed our tent we drove into the park and stopped at the Sunset Point. We really had good light there and it just was amazing. 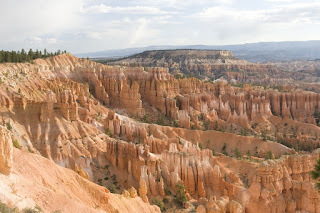 From there we did the Navajo Loop Trail and parts of the Pikaboo Trail which both were really well worth the effort. Afterwards we visited the remaining viewpoints in the National Park, however, none of them could compete with Sunset Point and the view we could get from our campsite. 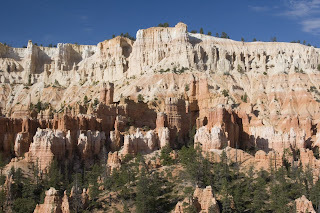 We concluded our visit of Bryce Canyon National Park by watching the park movie. At around 1pm we started our way back to Salt Lake and stopped at Provo for shopping and had all-you-can eat buffet at Sizzler's :-). 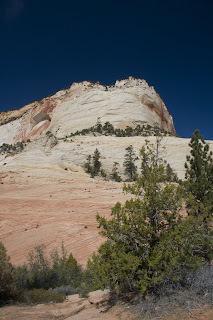 In the morning we drove from Page to the Zion Canyon National Park. 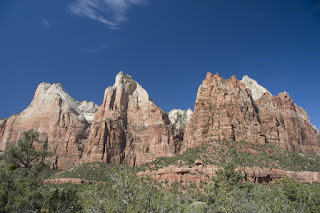 We entered the park via the East Enterence and took the scenic Zion Mount Carmel Highway to the Zion Canyon Visitor Center. 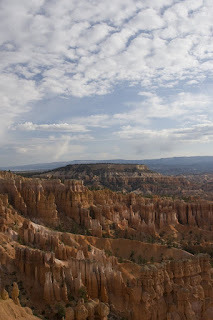 There we had to park our car and take the shuttle bus into the canyon. As the bus operate every 6 minutes it was quite convenient for us. We left the shuttle at several stops to do short hikes. 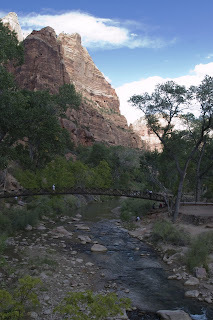 We stopped at the Court of Patriarchs, did the Emerald Pool Trail and a very short hike to the Weeping Rocks. We had not much luck with the weather in the park as it was cloudy most of the time and there were local thunderstorms. 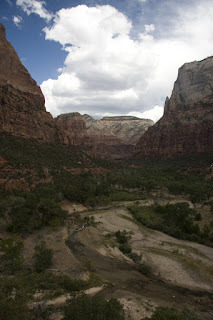 But still the visit of Zion National Park was well worth. However, much more time would be needed to really explore the park in detail. 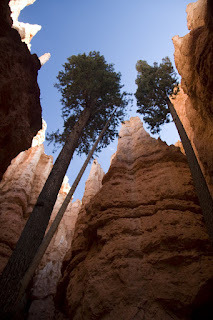 In the afternoon we left the park again via the east entrance and drove to Bryce Canyon National Park. 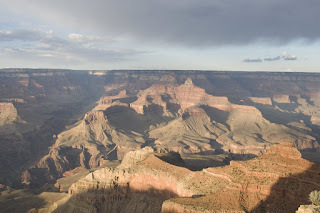 We got a really gorgeous campsite there at the North Campground right next to the North Rim of the Canyon. 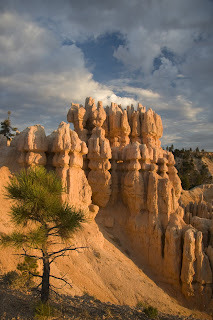 Havind such a well located campsite we could really enjoy the beauty of Bryce Canyon at sunset. When it got dark we made a campfire and grilled some meat and corn. It was awesome. Today we stood up at 4:15 in order to be at the Bright Angel trailhead at sunrise. We took the first shuttle bus to the trailhead and arrived there at around 6:00. So early in the morning the temperature was still quite nice and we progressed quite quickly. It was still too dark for making nice pictures and we therefore did not make many rests on our way down. At Indian Garden which is a bit more than half the distance we filled up our camelbacks and made a short pause to eat. Hiking down the canyon we met quite some people who were already on their way up. 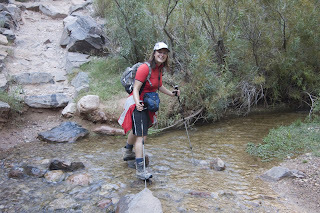 They were either backpackers who have stayed the night at Phantom Ranch or one of the few day hikers hiking to the Colorado River and back on one day. 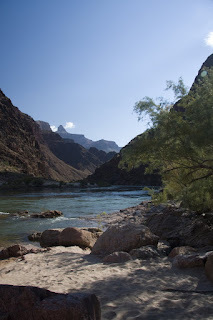 When we reached the Colorado River after about 13 kilometers and 2 hrs 30 we have lost about 1400 meters in elevation. The temperature at the river was surprisingly pleasant. We ate a bit and jumped then with all our clothes into the river in order to have it less hot when hiking back. 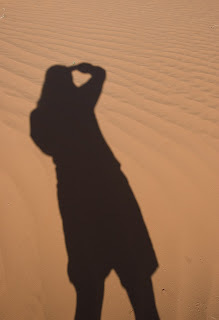 The first part of our hike back was still in the shadow, but the temperature increased steadily and hhiking got more exhausting. It only took as 1:15 to reach Indian Garden where we filled up our camelbacks again. 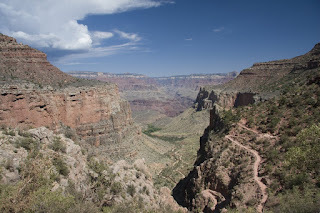 However, I got a bit tired from the long hike and the heat and we slowed down a bit and reached the canyon rim safely after about 2 more hours of hiking. 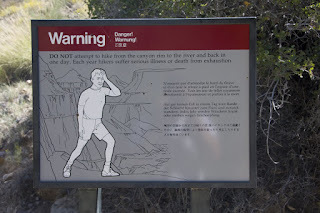 Warning signs can be seen everywhere on the trail. 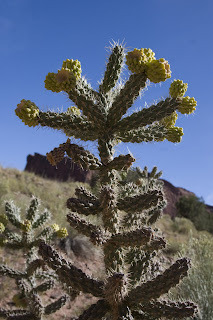 On hot days around 60 hikers have to be treated with heat related problems. 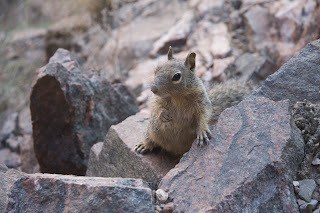 After being back at the rim we got us something to eat and waited for Regina who did not join us for the hike. 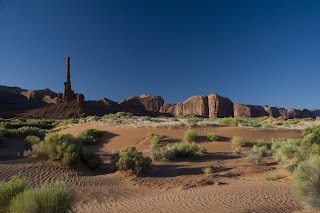 We then drove to Page where we stayed overnight. On our way back we stopped at several of the view points to take pictures. 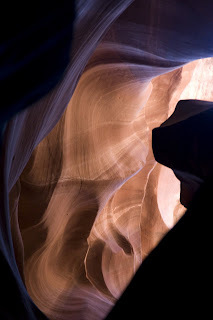 In the morning we did a tour of the Antelope Canyon. 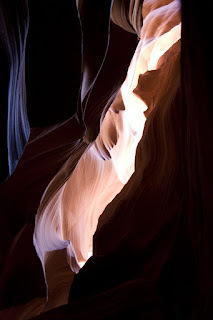 Unfortunately, the Photo Tours were sold out and we could only do a short tour of 1 1/2 hours. 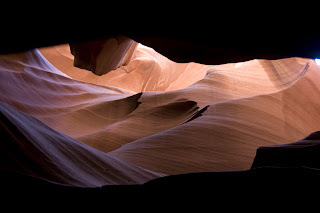 In addition the canyon was very crowded as there are still numerous tourists (probably due to the weak dollar) which is quite unusual for this time of the year. 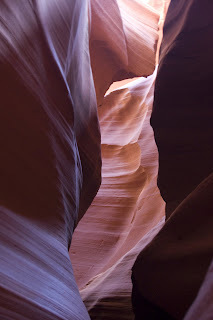 The canyon was really beautiful, but taking pictures was quite difficult due to the crowds and at the missing tripod (which I left in the car :-(). 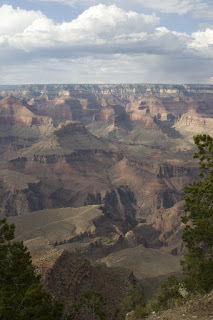 After the tour we drove to the Grand Canyon where we stayed at the Mother Campground. After having set up our tents we drove to several of the viewpoints. The weather was not really good for taking pictures as it was cloudy and the sun only came out occassionally. But still the views were once again very impressive. For dinner we went to Tusayan where also the National Geographic Visitor Center is located. 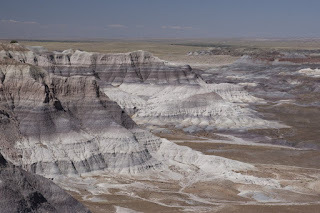 We got tickets for the famous Grand Canyon IMAX film, which was really well worth watching and had pizza at the Pizza Hut. 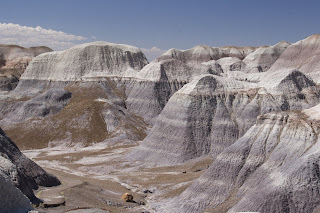 We spent most of the day today visiting Petrified Forest National Park. 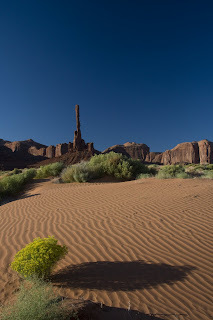 We started our visit with a stop at the Painted Dessert Visitor Center where we watched a great movie about the park. 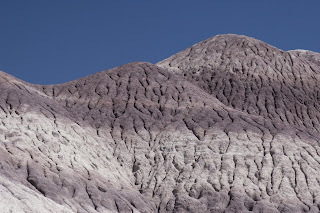 We then visited the Painted Dessert area of the park with is just north of Route 66. 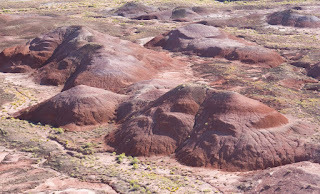 We stopped at several viewpoints to see the colourful badlands with bands of greys, reds, oranges, yellows and violets. After having visited the Painted Dessert area we drove to Puerco Pueblo where the ruins of an ancient Puebloan village can be seen. When we came to this place a ranger talk was just about to start and we decided to join. We learned about the different plants in the area and how the Puebloans used them for food and got to see different petroglyphs. Interestingly enough some of those where used as a calendar to know when to crop. 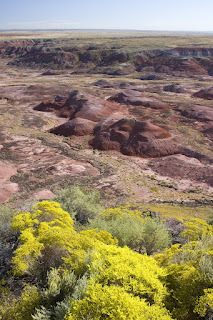 Right after the ranger talk we did the trail at Blue Mesa which was well worth due to the magnificent colours of the rock. 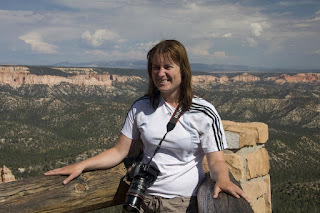 We then visited the Crystal Forest, the Giant Forest and the Long Logs. 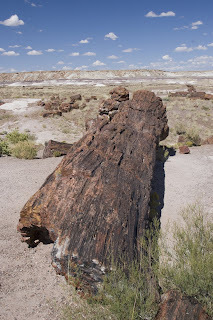 At all these places we could see petrified wood being more than 200 years old. During the Terriasic period there used to be tropic rainforest and the remnants can be still seen today. 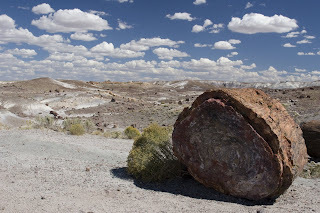 Unfortunately, the petrified forest is getting less and less as huge amounts of wood are stolen every month :-(. 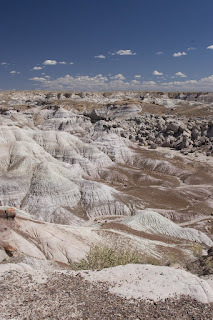 After a great day in Petrified Forest National Park we drove to Page where we stayed overnight. 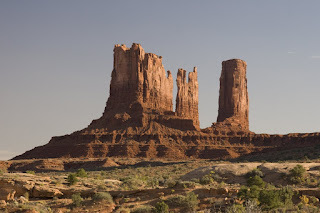 Today we had to wake up very early as we have booked a guided tour to Monument Valley starting at 7:30. Our guide, Fred, brough us to different nice places which are only accessible with a guide and showed us the best places to take pictures. It was really great as Fred gave us a lot of hints how to make the best out of our shots. 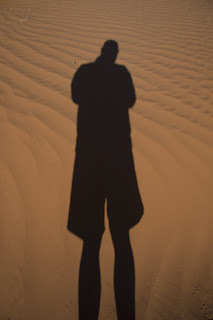 Can you see the man? 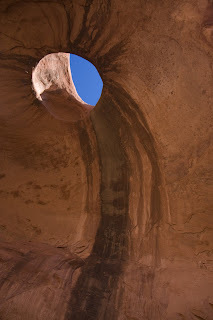 After a great time in Monument Valley we drove further south to visit Canyon de Chelly. 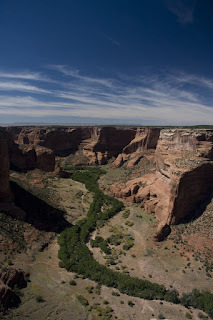 Canyon de Chelly was inhabitated by people already for a very long time and is a sacred place for the Navajo. 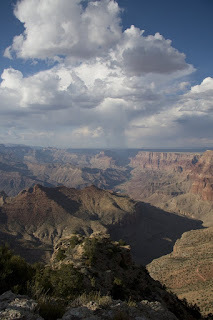 We did the South Rim trail (due to the better light in the afternoon) and went to most of the viewpoints. 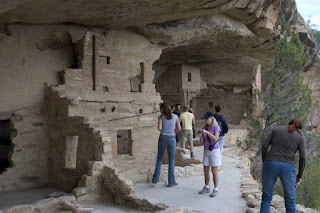 In addition, we walked down the canyon (about 600 feet of elevation) to the Sliding House Ruins. 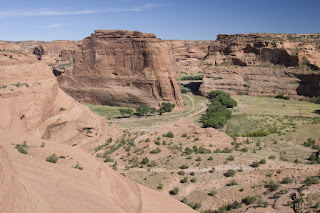 The hike was well worth the effort as we really could enjoy the beautiy of Canyon de Chelly. 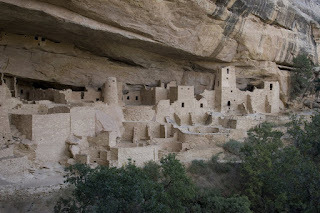 Today we left our hotel quite early to get early tickets for the cliff dwellings in Mesa Verde. 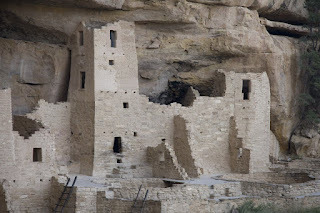 Fortunately, we got tickets for the 9 am tour of the Cliff Palace, the biggest cliff dwelling in Mesa Verde. 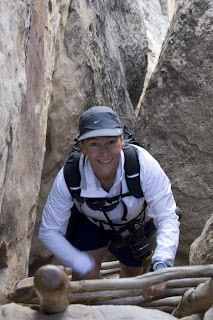 The way down to the Cliff Palace led us over steep stairs. 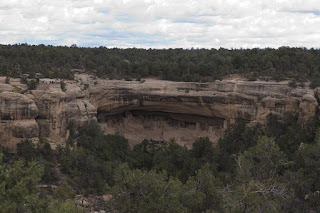 Construction of Cliff palace took place in the 1200s when many of the Ancestral Puebloans moved from the mesa top to the overhanging cliffs. 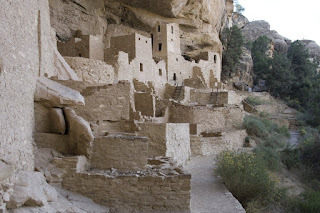 Many people believe that the cliff dwellings were built as a defense, but in fact the dwellings were built due to environmental changes. 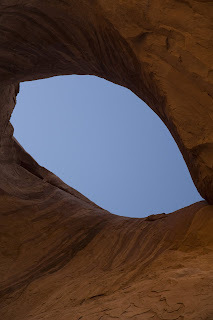 Materials used for construction were sandstone, clay and timber. And it is the timber which allowed to date the construction of the Cliff palace relatively precisly. The buildings of the Cliff palace served different functions: there were living spaces, storage buildings and kivas (ceremonial places). 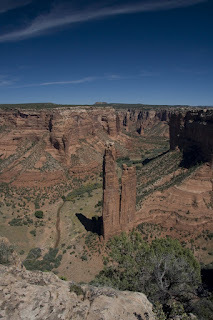 After the Cliff palace tour we did the Mesa Top Loop. 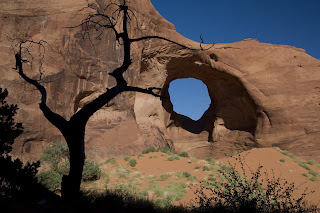 The loop brought us to different sights on the mesa top. 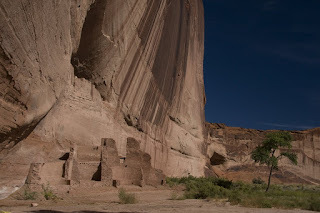 We saw different pithouses which were the first permanent houses of the Ancestral Puebloans (before this they lived as nomads). 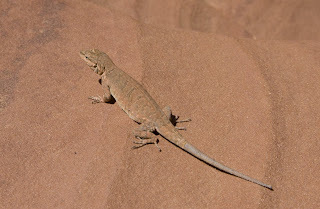 The loop also provided us with excellent views on the cliff dewellings. We then did another guided tour, this time of the Balcony House. It is smaller than cliff palace, but better preserved. 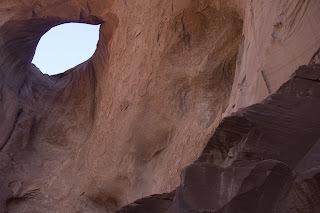 In addition, it is more adventurous to visit Balcony house as you have to climb a 10m ladder to enter and you have to exit through a tunnle and several ladders. We then visited the museum not far from Balcony House to learn more about the Ancestral Puebloans. 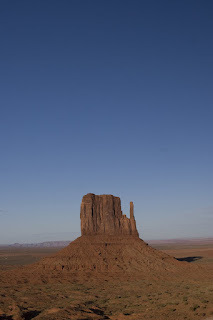 In the early afternoon we left Mesa Verde and drove to Monument Valley. 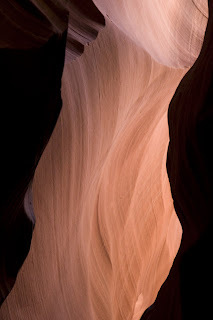 We arrived there in the late afternoon and had quite a good light for taking pictures. We stayed at the Goudling Campground for the night, which can really be recommended. The campground provides excellent facilities and has not only an indoor pool, but also wirless internet :-).